Additive Manufacturing (AM) offers the opportunity to produce complex shapes to enable the inspection of previously inaccessible part features. 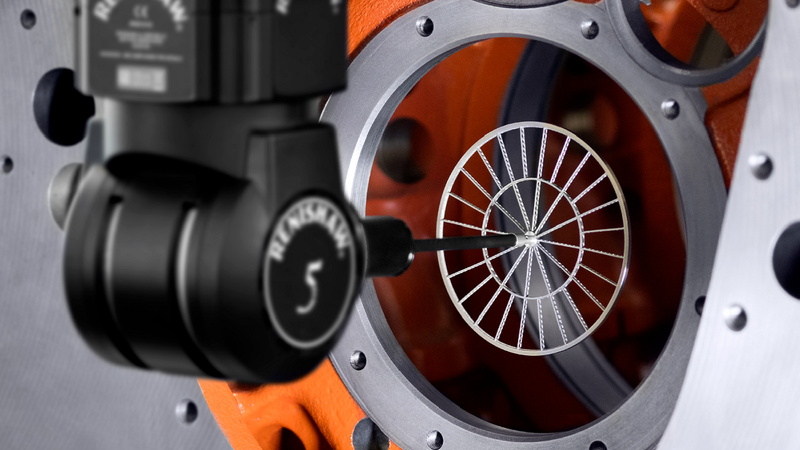 AM styli are designed to heighten the capability of Renishaw’s REVO 5-axis CMM multi-sensor platform, providing increased flexibility when accessing component features. Combining the flexible technologies of AM and the REVO multi-sensor platform allows manufacturers to have greater freedom in part design. Parts that previously had to be designed to allow inspection access by traditional styli, can now be designed without such metrology restrictions. AM styli can be made with intricate, complex geometry that offers advantages over traditional styli and can meet design challenges for both new parts and existing ones. Disc styli are a solution for measuring large features on components, but designing them has been problematic in the past. The discs could only be manufactured in ceramic, which limited the sizes it was possible to produce. A custom AM stylus can provide a stiff and lightweight structure that can be manufactured to a larger diameter than a ceramic styli. A 100 mm titanium disc, with ground outer surface, designed and made by Renishaw, weighs just 13 grams, which means it can be fitted to the REVO multi-sensor platform providing a 70% reduction in weight compared with a conventional disc stylus of similar size. Renishaw AM custom styli are designed and produced in house ensuring short lead times and high quality standards using laser powder bed fusion can creating strong, lightweight structures enabling repeatable and accurate metrology results.